MATERIAL - We provide nonwoven material from 0.5-1.5 oz/sq.yard, which allows light transmission and has good heat insulation. 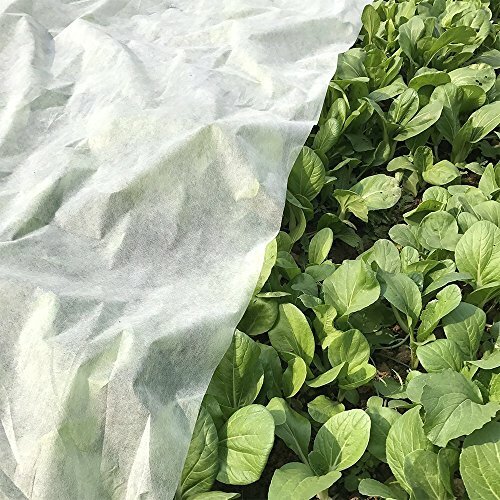 UV RESISTANT - Longlasting and durable garden fabric matrial help protect your plants in strong sunlight, windy days or extremely terrible weathers. FUNCTION - Contribute to extending growing seasons, frost protection, seed germination, shading & bug/insect barrier. APPLICATION - Perfect plant blanket for your plants, shrubs, trees, newly-grown grass for example. And you can also apply it for greenhouses and raised garden beds. LONGLASTING - Available for 3-5 years. MATERIAL - 1.5 oz/sq.yard nonwoven fabric, with light transmission up to 50%, protect your plants for summer shading and bug/insect barrier.